Caroline Pozo prepares to hit a backhand. The Wildcats look to win their second straight game against a top-10 opponent. 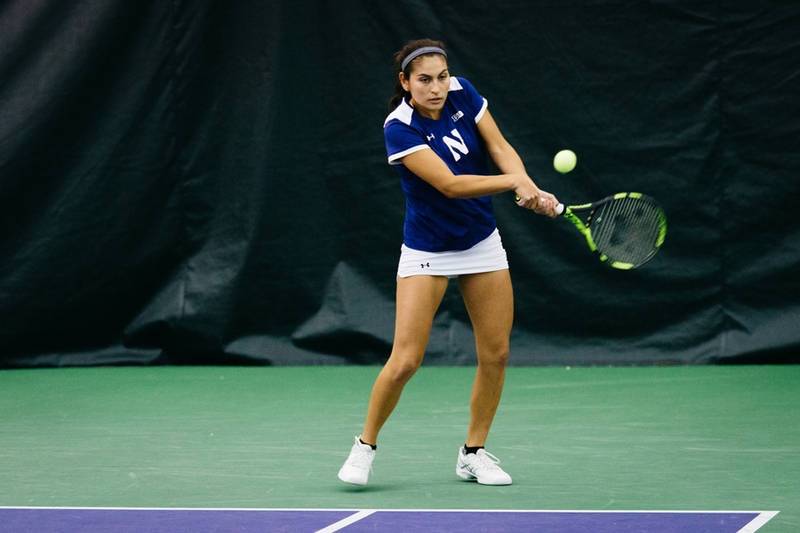 Entering the spring half of its season, Northwestern will open up conference play with matches against No. 5 Illinois on Friday and Iowa on Sunday. Coming off an upset win over No. 7 Vanderbilt last weekend, the No. 14 Wildcats (6-3) will look to extend a three-match winning streak that has included two victories over ranked opponents. After jumping 10 spots in the latest rankings, NU hopes to carry its non-conference success into Big Ten play. The Fighting Illini (10-1, 1-0 Big Ten) are yet another addition to the Cats’ unrelenting schedule. NU’s sixth top-25 opponent in 10 matches, Illinois has had a near-perfect start to its season, falling only to current-No. 1 North Carolina. With three wins against ranked opponents, the Fighting Illini have established themselves as a women’s tennis powerhouse. The Cats will then return home and shift their focus to the Hawkeyes (6-3) just two days later. Historically, Iowa has not fared well against NU. With just two wins in the 46 total matchups between the schools, the Hawkeyes will be seeking to secure their first win against the Cats since 1992. Iowa freshman Yufei Long will look to play a part in breaking the Hawkeyes 26-year drought against NU, as she tries to remain unbeaten on the year after a 9-0 singles start. The Cats, meanwhile, will be hoping just to remain in current form. Coming off a dominant victory over a top-10 team, they will be looking to replicate their efforts on both the singles and doubles ends in hopes of securing a second-such win in as many matches. After suffering their first loss a week before, the No. 2-ranked doubles pair of seniors Maddie Lipp and Larner bounced back against the Commodores by taking down the No. 23 doubles pair. Larner also dispatched Fernanda Contreras, the fifth-ranked singles player in the nation. NU will look to set the tone in what it hopes to be a successful conference season when it travels to Champaign on Friday. Illinois is representative of the type of competition the Cats have been facing all season: elite. By the end of the regular season, NU seems likely to be one of the most battle-tested teams in the country.